In light of the City’s recent decision to vacate yet another Downtown alley, Urban Angle is examining some of Kansas City’s most interesting in-between spaces, and why they are worth preserving. Every day this week, we will visit a different alley, each with its own unique contributions to the experience of the City. This is Part Two of Five. For an introduction to the series, check out Part One here. We’re curious to know which alleys are your favorites and why. Let us know in the comments and we’ll add it to the list! The Power and Light alley functions as a pedestrian highway of sorts between hotels and convention activities to the west and entertainment to the east. 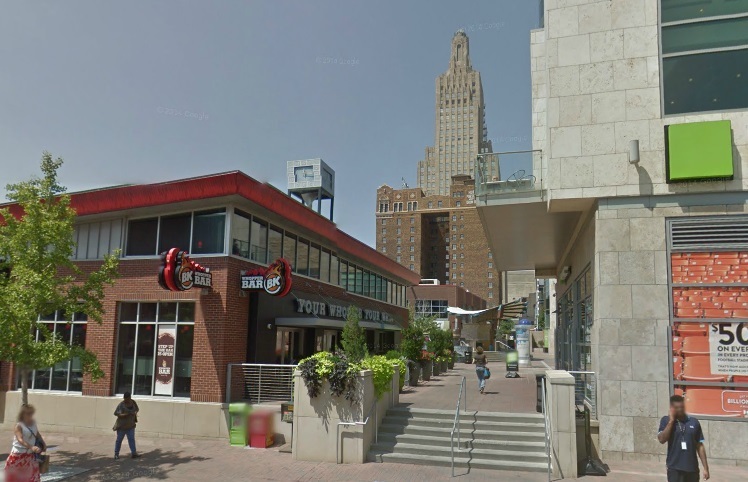 Whatever one’s opinion of the Power and Light District, there is no denying that the alley between 13th and 14th Street is filled with people all of the time, and it is no surprise why. Intentionally designed as a series of distinct public spaces, the alley invites people in and gives them reasons to stay. The connection functions as a true alternative pedestrian path, bravely teaching Kansas City drivers how mid-block crossings work (and that they exist). 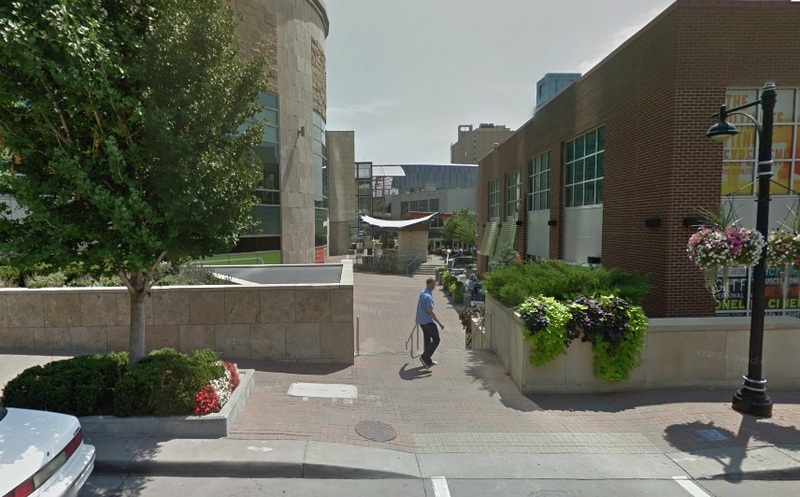 This alley system provides one of the only direct visual and physical links between two civic icons, the Sprint Center and the Municipal Auditorium, and serves as a pedestrian highway of sorts between the hotels and convention activities to the west, and the entertainment offerings to the east. Businesses, restaurants, and retailers front the alley space, giving people a reason to be there, and an amenity-rich environment with special paving, lighting, landscaping, fountains, seating, pavilions, and other features makes it a place that people linger and congregate. The Power and Light alley is teaching Kansas City motorists about mid-block crossings one pedestrian at a time. East of Main Street, the alley is completely given over to pedestrians, but between Baltimore and Main, it continues to function as a multi-purpose space, providing service access to the President Hotel and access to the parking garage, while still accommodating a high volume of pedestrian traffic. Pedestrians, retail, motorists, and service functions coexist in this section of the Power and Light alley between Baltimore and Main Street. There are some downsides. This alley isn’t truly public. It faces all of the challenges and constraints of every other semi-public, privately managed space. Who can be in the space, when they can be there, and what they can do while they are there is restricted in a way that true public spaces are not. 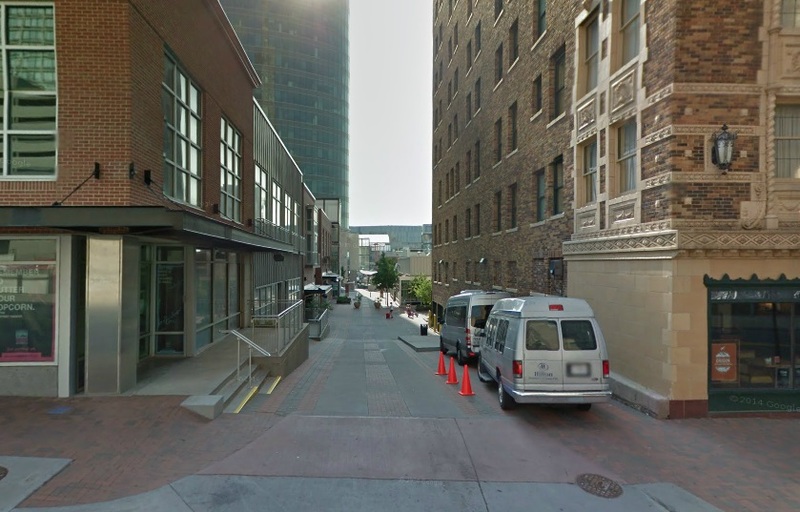 However, there is no reason true public alleys could not be intentionally designed in a similar way. The other disappointment is the westernmost leg of this alley system between Wyandotte and Baltimore Streets. 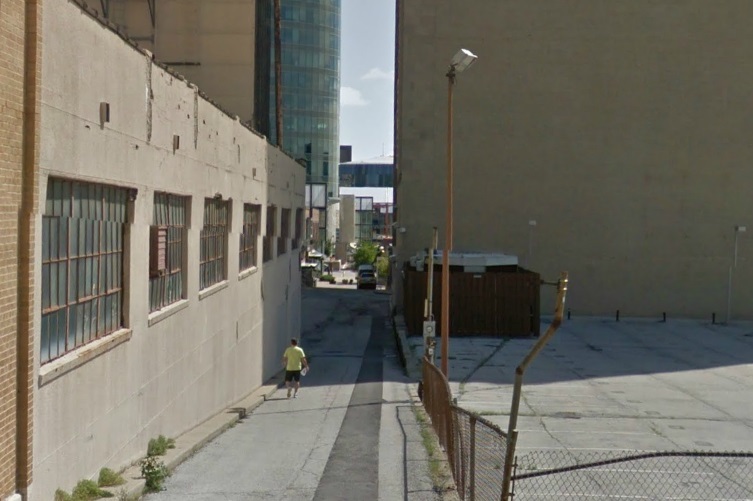 Despite efforts by the Downtown Neighborhood Association to advocate for continuation of the pedestrian experience all the way west to Municipal Auditorium, the proposed redevelopment of the Power and Light Building was approved with no attention to the alley whatsoever. Construction has begun already on this project, where this section of alley will become service only, with only a parking garage, blank concrete wall, and a few electrical transformers to greet visitors. That is certainly an opportunity lost. Renovation plans for the Power and Light building provided an opportunity to embrace and improve this westernmost section of the Power and Light alley, but instead will ignore it completely. This is the second part of a five part series, exploring a different alley each day this week. Check out Part Three here, or go back to the beginning.